← Welcome to Spain, Amigos! I was recently looking through photograph albums from various places I have visited. While scrolling through the photos, I noticed a common thread: many of them had been taken from a different perspective, and I had not even realised it as I was snapping away. The photos that caught my eye were all taken whilst looking up. 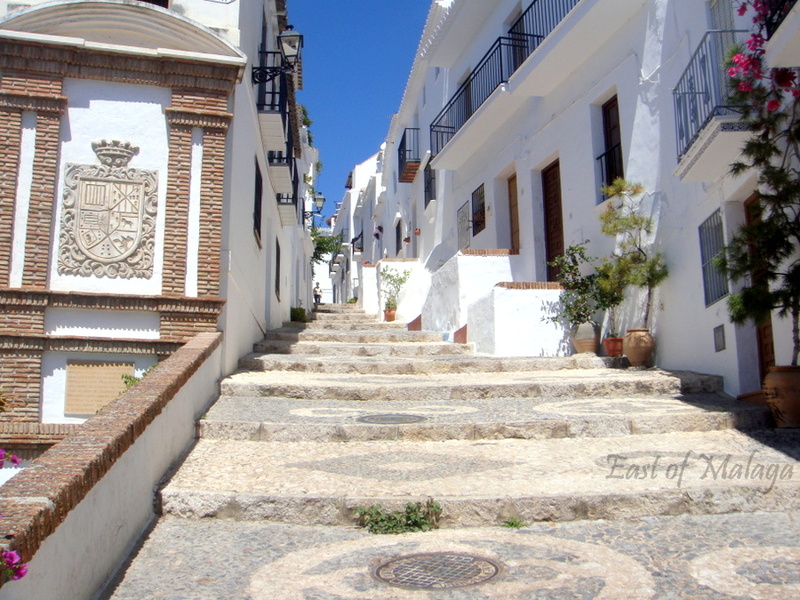 Here are the steps of a street leading up to the higher part of the white, mountain village of Frigiliana. This lovely shot not only includes the perspective of the narrowing of the steps as they climb into the distance, and the sunshine and shadows playing on the impossibly white walls, but also, it´s a great record of the clear, blue Spanish skies. 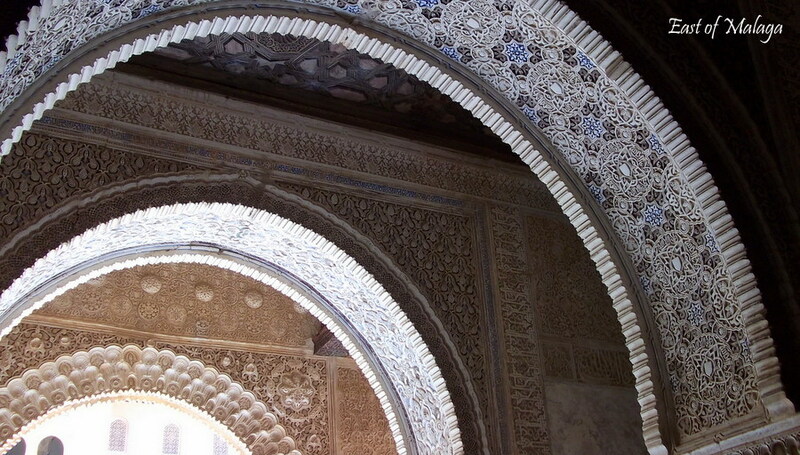 This stunning series of Islamic arches with their intricate designs decorate part of the Alhambra Palace, typifying the remains of Moorish dominion within Spain, which ushered in the last great period of Andalucían art in Granada. La Iglesia de Nuestra Señora de la Asunción (Church of Our Lady of the Assumption) in the main square of my home village of Cómpeta was beautifully lit against the clear, night sky, during the Fería last weekend. Islandmomma writes passionately about her adopted homeland on the island of Tenerife in the Canary Islands. Linda and I have been online friends for many years, through our shared love of books and travel. One of my favourite posts on Islandmomma´s blog is her huge photo journal of Tenerife page. Be prepared to be fascinated by her many wonderful photographs. Another Day in Paradise shares her travel stories from around the globe and is always quick to leave appropriate and supportive comments. As well as her stunning travel photography, this orchid-loving Dessert Queen is always ready to tempt you away from your diet with her sweet variations. Click here to find out how the CBBH Photo Challenge works. I´m looking forward to seeing your interpretations! This entry was tagged Andalucía, CBBH Challenge, CBBH Photo Challenge, photography, Spain, Sunday Post, Travel theme, weekly image of life, Weekly Photo challenge. Bookmark the permalink. That´s a great post. You´ve made it so difficult to choose between all your photos, but I think I´ve narrowed it down to two favourites – the hotel window and the bronze drunken sculptures! So now I get chance to HOP over to your links. See you again, next month for another exciting CBBH Photo Challenge! Hey Tamara – what a great job you´ve done for this month´s challenge. You have not only captured a really different view looking up El Zacatin in Frigiliana but you´ve also learned how to do so many new things on your blog. I´ve just visited your links to Rachel and Margaret´s blogs and left comments too. Hola Marianne… Here is my contribution to your challenge 😀 http://bopaula.wordpress.com/2012/08/15/cbbh-photo-challenge-looking-up/ Saludos! Fantastic shot, Paula. I particularly like the fungus growing out of the trunk, part way up. Thank you Marianne 🙂 Feel free to listen to my music too. here’s my post! I really enjoyed going through posts and photos to select these – thanks for a great idea, and looking forward to next month’s theme already! off to check out some new blogs too! What a fantastic start, Alyson! I hope you don´t expect me to pick my favourite photograph – I´m spoiled for choice! Thanks for your entry into the CBBH Challenge. Off to hop over to your links now! It’s a great topic. I’m waiting till I get back to Colmenar on Tuesday before heading out for a walk to take some pictures. Some danger of tripping though as I’ll be looking UPWARDS! Yes they are – and even more lovely in real life. I´ve been to the Alhambra a couple of times and never fail to be amazed. What a fabulous time with all the colourful hot-air balloons to look up to! I love stained glass windows. Not only are they so colourful and beautifully made, but each tells their own story. Lovely contribution, Christine. Damn you take great photos 🙂 I especially like the steps 🙂 I like the shadows, the blue sky and the detail in the steps. I think the shadows actually compliment the colour of the steps themselves. Thanks Richard. There are so many fantastic places to photograph around here, so I guess it makes taking the shots much easier. 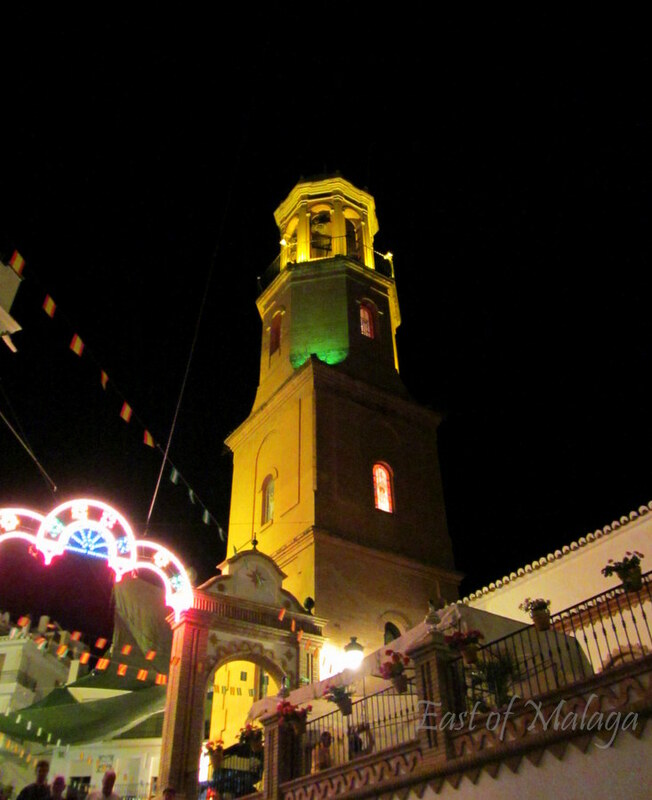 Frigiliana has won the “Prettiest village in Spain” competition in the past – it´s a photographer´s dream! Hope you are soon feeling better, Paula. Looking forward to your interpretation on the Looking Up theme.